Knit By God's Hand: Its the most wonderful time of the year! My favorite Holiday is Easter - it truly is..... its Spring, its pretty colors, its about Christ rising from the dead - it doesnt get any better than that!!! But something that I get so excited for each year.... when I see the first Cadbury Egg!!! Oh my goodness... these are little pieces of Heaven to me! 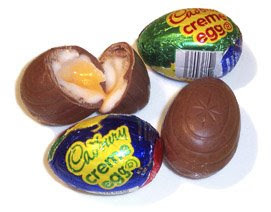 I think you either like them or you hate them.... for me - its more of a love relationship with Cadbury eggs. When I was growing up too - my aunt worked in a grocery store in a small Indiana town - the local IGA (do they still have those?). She knew of my addiction & I guess every day she would work, she would buy a few of these for me. At Easter, she would have a whole BOX to send to me... I'm talking like a BOX - not a little thing - I'm talking enough eggs to last me through the end of the year!!!! Look at my aunt literally feeding my addiction! So do you like Cadbury Eggs? All I can say is thank goodness they only come out once a year! Oh yes, I LOVE those too!! I agree that it's a good thing they are not around all year long, or I would have a major problem! I have to eat them very slowly because they are so rich. I bought my first box of peeps this season last night. YUM-O!!!!!!! Love!! With pink puffy hearts and glitter and rainbows and unicorns! Now Peeps I could live without!!! Oh I love cadbury eggs too! Especially when they are nice and creamy and runny inside. I hate when you bite into one and the cream inside is to cold and not runny. Mmmmmm, you make me happy! Not a Cadbury egg fan. I'm a Peep girl myself. Got that addiction from my mom. They were always a special Easter treat. I'm not too happy that they now make them for every holiday. Kinda ruins it. After all, you can't call a marshmallow Heart a PEEP. Well--I would love to take *one* bite of them and that would be enough for me! I usually can't do a whole egg--but I love the way they look w/ the "yolk" inside! i don't know why, but the look of the yolk in the middle just ruins it for me. i need to eat one with my eyes shut...i love plain old milk chocolate. yummo! I am slightly obsessed with the mini eggs but I still love the creamy ones too! Easter is my favorite holiday for all of the reasons in your post! YUMMY! I do love that Easter candy. I can't eat many of them because their too sugary, but I like at least one of those big eggs that are made of pure sugar. Do they even have a name? So good. Mmmmmm.... Actually I've never had one. The middle always looks a little (how should I say this)not appealing to me. I'll take Peeps. Easter is also one of my favorite times of the year. The Death, Burial and Ressurection. All necessary in order for us to gain eternity with Him in Heaven. My favorite are the reese's peanut butter eggs. MMM. Cadburys rock as well. BTW... which came first... the Peep or the Egg????? Cadbury Eggs are by far my favorite candy ever! I had them growing up and it makes me think of Easter too!